Digital Home Thoughts: No Drive Extender? No HP MediaSmart! No Drive Extender? No HP MediaSmart! "More bad news for fans of little Windows servers for home. HP, makers of the MediaSmart boxes that defined the first release of Windows Home Server, has confirmed that it is canceling plans to support the next major release of the OS, codenamed Vail." 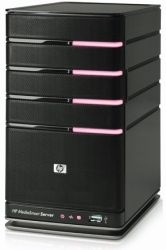 I can hardly say that I am surprised that HP is pulling out of the Windows Home Server market. Whether the removal of Drive Extender support in Vail is a good move or not, the negative buzz across the Internet makes it seem like no one is going to buy a server based on Vail. I do admit that Microsoft's decision has affected me and am already looking at alternatives to Windows Home Server and Drive Extender for my next NAS solution. Maybe Microsoft is right and with multi-terrabyte drives, drive pooling is not really needed anymore by the average home user. What I can see is that Vail no longer looks like a step above other NAS solutions and if my own needs were meager enough, cloud computing would even be enough.